For the fifth year in a row, Pro-Ject Audio Systems is returning to sponsor the international event Record Store Day here in Australia. On the titular day, vinyl-lovers descend on record stores to snap up limited edition releases and discounts, enjoy in-store gigs and DJ sets, and celebrate beloved record stores. Pro-Ject return as the Official Turntable Partner of Record Store Day Australia. As part of the festivities, Pro-Ject is giving one vinyl-lover the opportunity to win an Essential III Phono turntable in a Walnut finish. To be in a chance of winning, entrants need to post a photo of their “weirdest” or most unusual record on Instagram or Facebook with the hashtag #RSDWin, and tag Pro-Ject (@project_audioon Instagram; @ProJectAUNZ on Facebook). Once posted, entrants need to head to recordstoreday.com.au/win/ to complete entry. Two runners-up will win a Spin-Clean Record Washing System, to bring new life to dusty LPs. 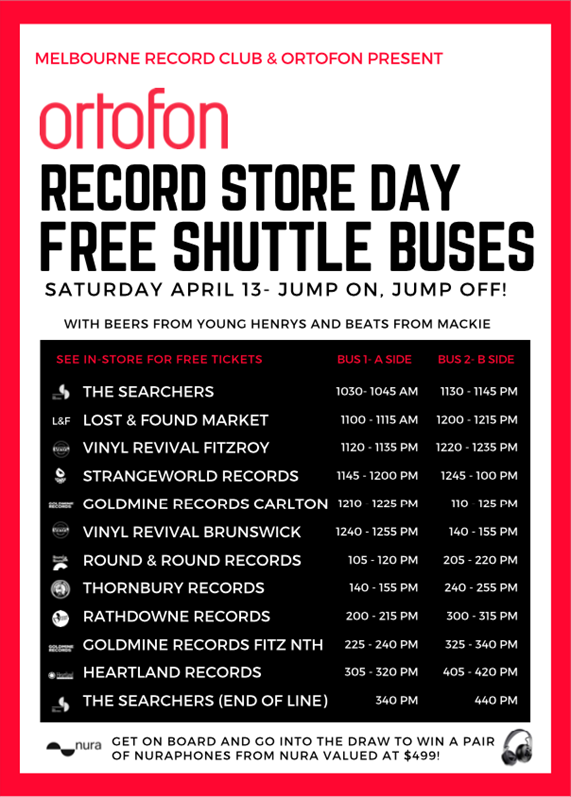 Record-lovers in Melbourne will also enjoy two free Ortofon Record Store Day shuttle buses courtesy of Ortofon and Melbourne Record Club. Tickets are limited (but free), and attendees will enjoy giveaways including Nura headphones valued at $499, Young Henrys’ beers, and gigs — see image below for schedule.